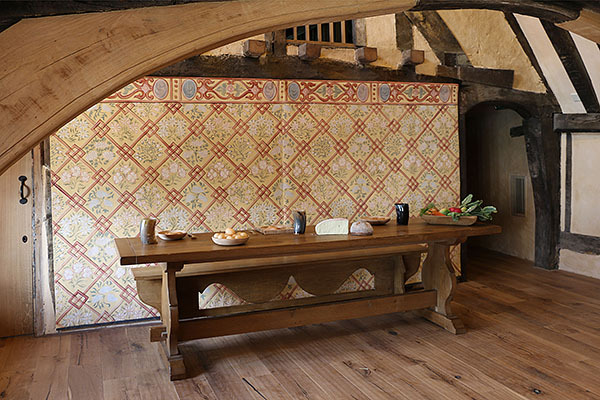 16th century style oak trestle table and bench (or form as they were sometimes referred to in contemporary inventories), shown here in the later floored over great hall, of this restored and once important (still is now!) Wealden hall house. As social patterns changed in the 16th century, together with the development of chimney flues, the need for a great hall as a communal area and status symbol, was given over to the requirement for more private accommodation and safer brick chimneys. This building, now an educational museum, retains these later developments. To see another view, click: Medieval style oak trestle table & bench in C14th hall house and to read our managing directors blog about the venue, click: Bridge Cottage - A C15th Wealden Hall House, floored over.